We just announced last week a major new product to our growing suite of cloud business management solutions: Adaptive Consolidation. We have heard you — our customers, prospects and partners — ask us to help streamline the financial consolidation process. You asked us to do for consolidation what we have done for planning. And that’s exactly what we did. With Adaptive Consolidation, your period-end consolidations are faster, easier, and more collaborative. Check out the media and analyst coverage to date, which has been very positive. Using simple, user-defined rules, Adaptive Consolidation makes it easy to consolidate entities with multiple currencies, complex ownership structures, intercompany transactions, and complex allocation schemes. And then use our drag-and-drop report builders to create the consolidated reports you need. With this announcement, we are the industry’s only complete integrated cloud BI & CPM solution. Adaptive Consolidation provides out of the box integration with our CPM & BI Suite. The new product offers a unique intuitive user interface to make incredibly complex and time-consuming processes appear to be easy. Adaptive Consolidation delivers immediate results and validation, which means no waiting for jobs or processes. We know that our customers are increasingly global, bringing with them unique regional needs. With that in mind, Adaptive Consolidation was designed with the flexibility to enable GAAP and IFRS reporting and to meet the audit controls and tracking you need. 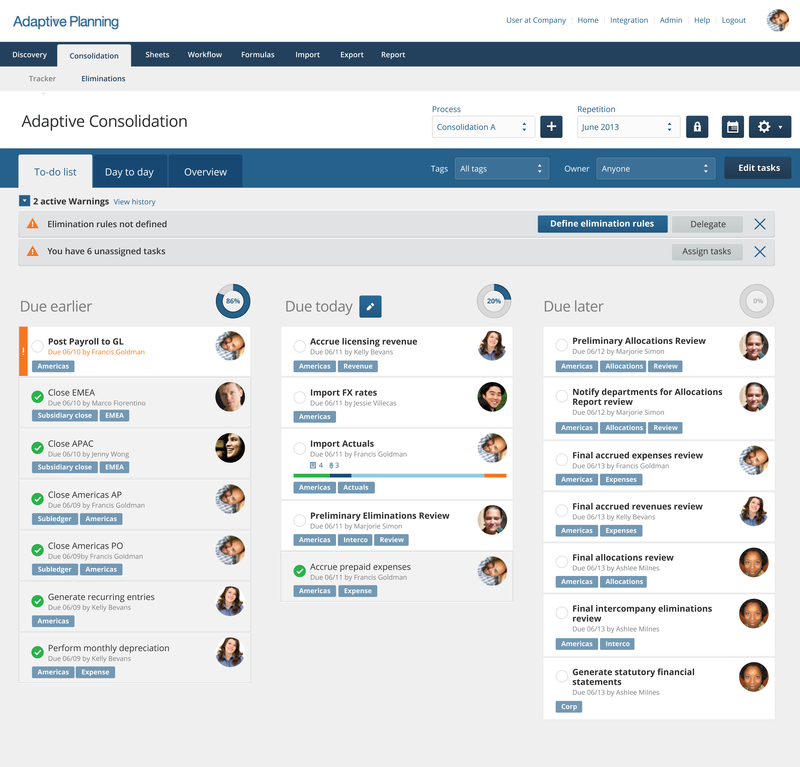 A key element illustrating the new design of Adaptive Consolidation is the robust, flexible, and visually intuitive Process Tracker, which provides easy ways to define and monitor one-time and repeating processes. Users can define specific deliverables, assign them to users, monitor their status, and track their closure. With its leading-edge visual impact, rich functionality, simple usability, and ease of management, it will be the “must-have” among task and process management tools. We can’t wait to show you all that you can do with Adaptive Consolidation. Ask your salesperson for a demo. There will be lots of opportunities to see Adaptive Consolidation in action at the Accelerate User Group in San Francisco on May 20-22.